This massive supplement clocks in at 160 pages, 1 page front cover, 1 page editorial/ToC, 3 pages of SRD, leaving us with a massive 155 pages of content, so let’s take a look! So, long, long before, back in 2013, before we even could conceive of Occult Adventures becoming such a great Paizo book, there was a humble pdf that fluttered on my digital shelves. It came with an unpretentious cover that read: Legendary Classes: Covenant Magic. It included a base class, then called “medium”, which proceeded to blow my mind, earning the supplement a spot among my Top Ten PFRPG products. Then, there were expansions, and these actually managed to retain the quality and imaginary vision of covenant magic. In a way, this was an occult class, before “occult class” was a thing; you know, a class with a complex and rewarding action economy and player agency that does not simply escalate numbers, but instead has unobtrusive and rewarding ROLEplaying angles baked right into its very design. 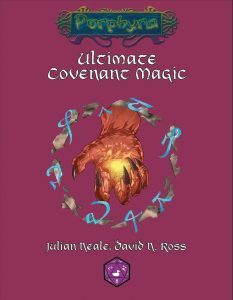 This may just be me, but with the release of Occult Adventures, I never stopped thinking of Covenant Magic as pretty much one of the origins of this rewarding school of class- and RPG- design. Now, it should be noted that Ultimate Covenant Magic is NOT simply a rehash of the previously released material; Purple Duck Games have gone the extra mile here, which should be obvious from the get-go when simply comparing pagecount; moreover, the ducks have went through Covenant Magic with a finetooth-comb and reassessed all components herein, ironing out the very few rough patches the original files offered, while heaping new content galore on top – this is how compilations should be! Fast forward to today and the issue of nomenclature: We get this – the ginormous, ultimate iteration of an already stellar system. With Occult Adventures’ release, this book renames its first class covenant mage. The covenant mage gets d8 HD, 4 + Int skills per level, proficiency with simple weapons and light armor, ¾ BAB-progression and Charisma-governed spellcasting of up to 6th level – however, in a radical and daring departure from most classes, these are actually spell-like abilities, with all that entails. It is testament to the robustness of the engine and the skill of the designers involved that this never breaks the game. Covenant mages may not learn aligned spells, unless the covenant mage matches the alignment…OR has a covenant with a creature of that alignment! Yes, you can actually cast evil spells as the good guy here…with all that entails. Now, as the name makes abundantly clear, the focus here are covenants. But wait, sounds familiar? Isn’t there the phenomenal “Grimoire of Lost Souls” already out there? Well, yes, but Purple Duck Games’ system has a radically different focus – covenants are themed around general themes, not necessarily individual spirits – you could have a covenant with a sidhe court, with qlippoths and the like, as opposed to pacts with singular entities. The focus sounds similar on paper, but in practice and roleplaying, actually is radically different. It should also be noted that the systems work remarkably smoothly and distinctly when used in the same game, and could allow for a covenant/pact-only game without much hassle. One of these days, that’s just the campaign I’m going to run! But I’m getting ahead of myself. I was talking about player agency before, and the class, from level one onward, and again at 3rd, 7th, 11th, 15th and 19th level, gets a spirit boon – basically the talent-list of the covenant mage: These are not simple “You get class feature xyz”-tricks, btw. Wanted to sap speed with a touch attack? You can do that. Conjure forth a shield of roiling spirits? Once more, you can do that! Of course, a better, detective-style speak with dead can be found here, and the basic themes you’d expect have representations, but the list brims with enthusiasm and design-glee – one that is based in the scaling guidance imparted on the covenant mage by virtue of their spirit guide; and yes, while intangible (so no phantom-like pet), this lone, humble ability can engender great roleplaying all on its own…and changes the system in exciting ways, for some abilities require that the spirit guide be sent away/used in a specific manner. If you’re familiar with shadow-usage in shadow magic-based systems, you’ll get what I’m talking about. This could have just been, mechanically, a cool-down timer. Instead, it has this nifty little narrative angle that you can take or leave. It should be noted that the already pretty impressive list of spirit boons is expanded on later levels – multiple times. These alone provide more options than many classes have. Now, a central component of the covenant mage’s engine and perhaps one of the most impressive and concise rules-operations for a caster I know, would be their trance: 4 + Charisma modifier rounds, +2 rounds per class level after 1st; this trance may be entered as a move action, nets you rage-like bonuses to Constitution and Charisma as you channel entities, and allows the spirits to speak through you – which is a GREAT idea to explain why you can’t use spell completion/trigger items in a trance. It’s these little components, where even the tiniest thing makes sense from a narrative point of view, that set this apart…of, and then, there would be the covenants. Oh, and being knocked unconscious nets you +1 free, final round of trance. No, you can’t abuse it, but it does allow the respective entities to deliver threats etc. and corresponds with the classic and evocative tropes. Now, a covenant mage selects an influence – these can, for example, be angelic choirs, abyssal hordes, draconic, the occult, the unity, etc. Here, we have a bloodline-ish ability suite that nets a bonus language and determines the capstone of the class. However, they ALSO govern special spell-like abilities while in trance (scaling with levels) and trance covenants, which also scale. Sounds a bit bland for you? Nothing could be further from the truth! Just take the qlippothic redeemer. Some qlippoths argue that extinction of mortal life may not be the way to go to reclaim the abyss – you just have to ensure that no more chaotic evil souls go down there! Hence, there is a qlippoth-sponsored influence with the goal of redeeming everyone! I ADORE this. Doing the right things, for horrifically wrong reasons can make for a fantastic character concept and interaction with an influence that is malign and alien and just wants everyone to get along. That’s the yarn great tales are spun from. Anyways, this is NOT where the book stops; where, previously, we had but this one covenant-devoted class, we now get two: The book introduces the dervish, who gets d10 HD, 4+ Int skills per level, proficiency with simple and martial weaponry and light armor and light shields, as well as fast movement, full BAB-progression and a good Ref-save 4th level nets the SPs of the covenant mage style, once more governed by Charisma, scaling up to 4th spell level. You may have deduced as much from the presence of fast movement, but uncanny dodge at 2nd level would be another good indicator what we have here – a hybrid class of covenant mage and barbarian. And, I know what you’re thinking: “Now Endy will whip out the uninspired hybrid-bat.” Well, frankly, that’s not required. Quite the contrary, in fact. The class employs the trance engine; it has paths, which are the equivalent of influences (and yes, we get a ton of them, though not one for every single influence, only for those that make sense in the frame provided); it gets trance powers (kinda akin to rage powers and paths come with suggested trance powers) – oh, and the class is actually a solid skirmisher! I kid you not! Heck, path chosen influences, at high levels, the DR, with 8 different DRs noted, to account for thematic differences! This level of care is impressive; indeed, I’d like to state that the warrior-mystic angle has rarely been done this well; while the parent classes are obvious from the design choices made, the dervish manages to feel and play unique and exciting, rendering it one of the very rare examples of a hybrid class that deserves its name, that deserves being included in the game, that has its own identity and soul. Now, here begin the 28 pages of archetypes – and while both covenant mage and dervish get AMPLE of choices here, it is my pleasure to mention that they are not alone: Wanted a covenant-using summoner? You can find that here. Inner Eye Fighters represent a rewarding covenant fighter option…oh, and did I mention that the book comes with full occult support, providing a means for Paizo’s often maligned medium class to become cooler via covenants? Or the death negotiator spiritualist? Does haggling with spirits for power sounds like a story that reminds you a cherished villain/hero in a comic book? Well, guess what: We even get a vigilante archetype here, with the spirit-chosen! Oh, and what about covenant-related hexes for both witch and shaman?? Want a covenant magic with anti-tech guide tricks? An engine-tweak by donning masks? Covenant mages with hexes, revelations or bloodlines? Yep, you’re covered. Similarly, if you want a divine dervish, unarmed mendicants or mounted dervishes, you’ll find what you’re looking for inside. Now, beyond influences, covenant magic as a system is NOT hard-baked into classes; or, well, it kinda is in a way, but in theory, pretty much anyone could use it! Why? Well, the 5 different covenant ability strengths are concisely codified for Gm and players alike, with save DCs based on the patron’s Charisma and HD. This may come off as surprising, but the mere existence of this simple and easy to grasp component (with prices, assuring WBL-consistency) helps against the murder-hobo syndrome. Players are less likely to want to slaughter, for example, the fey over there, when coming to diplomatic terms with them could provide cool, unique powers…and from the GM’s perspective, that is a rewarding way to dish out treasure and segue into new adventures. The gp-value table makes this pretty much a no-brainer task – look at a table, done. It doesn’t get more comfortable than this. Now, if all this contract-stuff sounds dry or too wishy-washy for you, rest assured that you’re not left hanging: The details and components are discussed in a concise and helpful manner, including the consequences of breaking covenants, etc. So, the covenants – the list of covenants included here, you know, the one that handily lists all the covenants alphabetically, ordered by power…is 4+ pages long. We’re talking about over 30 pages of such abilities, which allow you to breach through barriers, gain a kind of truespeech, a literally stunning voice, high level save-rerolls – they make sense! Want, for example, control of the strands of fate? Well, you better find a really potent being with mythic power or hero points…or a norn! Have a new buddy from the elemental plane of earth? Stone fists. Just sayin’! Know a potent undead or outsider with energy drain? Hej, when you get on with them, you may learn the art of the Soul Stealer… There also are a couple here, obviously, that are more limited, but you get the idea – this OOZES flavor. And yes, the classic restoration of youth can be bargained for… This is, in essence, a continuation of the design-paradigm that made the class options stand out – and it’s, in a way, the beating heart of the book; this is where we not only get material that can easily be integrated into any game, we have enough covenants provided and succinct, clear guidelines, that designing new ones should not prove too big a problem for anyone. This may sound dumb coming from me, with my love of fiddly, highly complex systems, but this level of accessibility is amazing. You could hand this to players and have them tinker with it. The system is that accessible. Oh, did I mention the page of mythic covenants that help if you’re playing mythic games? Oh yeah. Now, I should note that, usually, only covenant mages and dervishes can strike covenants, but the 10-page character-options section provides the feat-basis for universal access, though higher-powered games can ostensibly ignore these; as a whole, this provides the grit and investment decision I love to see, while the aforementioned detailed explanation of the covenants themselves allows the system to be used without prescriptively requiring them. If you’re playing a regular game, use the feats; if you’re going for high-fantasy, go the direct route – simple. Oh, and guess what? Mythic feats AND rewarding Story-feats included! As an example, Spiritual Defiance allows you to enhance the numerical bonuses of trance sans gaining the usual abilities, as you defy your influence. You’re grinning right now, right? I know I am! Really cool: The pdf acknowledges modifying three feats from Pact Magic’s chassis – in the TEXT, not just the SRD. That bespeaks of integrity. Oh, and yes, we also get both traits and drawbacks – and yes, bonus types are TIGHT. There also are a couple of new spells to be found, and we even get two background tables, Ultimate Campaign style, for Covenant Mages and Dervishes. Want advice, and I mean EXTENSIVE advice on running covenants in your campaign, on negotiating contracts, a ton of sample potential patrons for covenant-users? Variant offerings that codify life force, souls and even integrate with Horror Adventure’s corruption-mechanics? This delivers. Heck, we even get two cool sample organizations! Oh, and guess what? Two templates, a ton of NPCs (yep, up to CR 19…), and we even get two ready-made PCs for the new classes, at level 1 and 7. Editing and formatting are top-notch. From bonus type to rules language integrity, this is an achievement of a tome. Layout adheres to a nice, printer-friendly 2-column standard with purple highlights. The pdf sports a significant amount of nice full-color artwork, though fans of Purple Duck games may be familiar with the pieces. The pdf comes with extensive, nested and detailed bookmarks, making the use of the material herein super simple. Oh, and this being Purple Duck games, the whole text is open content. Yes. This is too rarely mentioned, but it’s one of the things I adore about Purple Duck Games. David N. Ross and Julian Neale, with additional writing by Mike Myler, provide a masterpiece. I mean it. This is the OG of the Occult design philosophy, and it is superbly impressive, more so than it ever was before – and that’s saying something! You see, I am very much cognizant that my love for complex, fiddly systems à la Interjection Games’ tinker or Michael Sayre’s Akasha is no secret; at the same time, complex systems are not for everyone; while a new system may provide a unique playstyle, not every player enjoys trying to wrap their heads around, for example, an engine like the kineticists. This is where covenant magic comes in. The genius of the design employed here is twofold: For one, the book manages to provide a crunchy system that is rich in story and actual roleplaying potential, which is not something many books achieve. But more importantly, it marries this potential with a playing experience that is utterly distinct and different from all Paizo-classes…while not requiring that you learn one bit of new system! This book manages the impossible feat of having the cake and eating it, too – it teases, coaxes and persuades the d20-system underlying Pathfinder in new and exciting shapes and forms. If you’ve read the Paizo-classes, you can play this. This is the most accessible subsystem I know, at least in this range of excellence; for, while it retains its superb accessibility, it also manages to do utterly unique things with its engine; it manages to carve out its own, distinct and design-as well as flavor-wise, unique identity. This ranks among my favorite 3pp-crunch books out there. It deserves to be mentioned in the same breath as “Ultimate Psionics” or the “Grimoire of Lost Souls.” Yes. That good. Let me put it differently: I have a policy regarding my Top Ten-list: If the components of a compilation have won a spot on my Top Ten, the compilation can’t be featured on it once more. I have never been this tempted to break this rule. I won’t, as that would be unfair. But oh boy, do I want to! Ultimate Covenant Magic is a masterpiece that oozes passion, care and attention to details; it’s, as noted, the small things that add up, that elevate this book to the lofty place it occupies in my esteem. My final verdict for this masterpiece, unsurprisingly after my glowing review, will be 5 stars + seal of approval. This also gets my EZG-Essentials-tag as a book I wouldn’t want to miss in my games. Why? Think about it: You can use covenants to combat that Christmas Tree syndrome of PCs with too much gear…replace magic item-rewards with boons and blessings that come with obligations and your game will take on a whole new direction. One more thing: Purple Duck Games is currently designing their Porphyra RPG – they will carry the torch of Pathfinder’s first edition with their very own spin. Books like this are what this game needs, so if that sounds like something you’d love, support the Purple Ducks! You can get this glorious book here on OBS!